This is great news, here is the press release from Greenpeace. Canada — Today 21 member companies of the Forest Products Association of Canada (FPAC), and nine leading environmental organizations, unveiled an unprecedented agreement – the Canadian Boreal Forest Agreement – that applies to 72 million hectares of public forests licensed to FPAC members. The Agreement, when fully implemented, will conserve significant areas of Canada’s vast Boreal Forest, protect threatened woodland caribou and provide a competitive market edge for participating companies. Under the Agreement FPAC members, who manage two-thirds of all certified forest land in Canada, commit to the highest environmental standards of forest management within an area twice the size of Germany. Conservation groups commit to global recognition and support for FPAC member efforts. The Agreement calls for the suspension of new logging on nearly 29 million hectares of Boreal Forest to develop conservation plans for endangered caribou, while maintaining essential fiber supplies for uninterrupted mill operations. “Do Not Buy” campaigns by Canopy, ForestEthics and Greenpeace will be suspended while the Agreement is being implemented. Environmental groups, including the three organizations that have been mobilizing large customers towards green products, say the coming together of two traditional adversaries reflects a new commitment to a common goal. Also vital to the agreement have been the efforts of the Pew Environment Group and Ivey Foundation, which worked to support the two sides coming together and to facilitate the negotiations. Signatory environmental organizations, FPAC, and the Association’s companies have begun meetings with provincial governments, First Nations and local communities across the country to seek their leadership and full participation in advancing the goals of the Agreement. Participants recognize that governments, including First Nation governments, are decision makers within their jurisdictions. The Agreement recognizes that aboriginal peoples have constitutionally protected aboriginal and treaty rights that must be respected and engaged in order for the Agreement to fulfill its objectives. The progress made to reach the objectives laid out in the Canadian Boreal Forest Agreement will be regularly measured and reported on by a jointly agreed-upon independent auditor. AbitibiBowater, Alberta Pacific Forest Industries, AV Group, Canfor, Cariboo Pulp & Paper Company, Cascades Inc., DMI, F.F. Soucy, Inc., Howe Sound Pulp and Paper, Kruger Inc., LP Canada, Mercer International, Mill & Timber Products Ltd, NewPage Port Hawkesbury Ltd, Paper Masson Ltee, SFK Pulp, Tembec Inc., Tolko Industries, West Fraser Timber Co. Ltd, Weyerhauser Compnay Limited−all represented by the Forest Products Association of Canada. Canadian Boreal Initiative, Canadian Parks and Wilderness Society, Canopy (formerly Markets Initiative), the David Suzuki Foundation, ForestEthics, Greenpeace, Ivey Foundation, The Nature Conservancy, and the Pew Environment Group’s International Boreal Conservation Campaign. The Hewlett Foundation’s support for boreal forest conservation has been critical to the collective efforts of these groups. I had a post last week about Facebook’s new data center being powered with coal. Greenpeace jumped on Facebook not long after, and I’m sharing some parts of a recent blog post Greenpeace has made on the issue. “How the internet is powered is an issue not just for Facebook but for the entire IT industry. The industry holds many of the keys to reaching our climate goals by innovating internet based solutions to mitigate greenhouse gas emissions and increase energy efficiency. Technologies that enable smart grids, zero emissions buildings, and more efficient transport systems are central to efforts to combat climate change. “Moreover, burning coal contributes the largest share of CO2 emissions globally, as well as contributing to increased asthma, acid rain, and mortality from other pollutants. Facebook’s decision to choose a company primarily powered by coal over other cleaner sources of energy is a missed opportunity to strike a blow against this dirty fuel and drive a clean energy economy. We expect more from a company that was recently named the most innovative by Fast Companymagazine. Greenpeace helped install solar panels in Kenya on the Senator Barack Obama School in Kogelo, and on the house of the President’s grandmother. Photos can be found here. Press release is below! 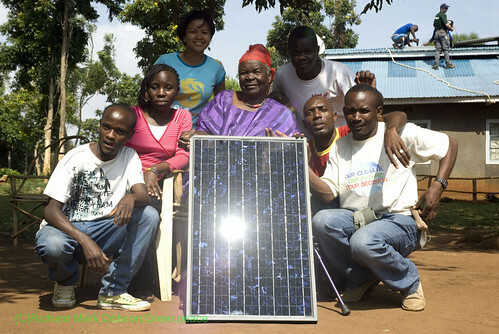 Kogelo, Kenya, 20 August 2009 – Young Kenyans working with Greenpeace’s Solar Generation are tackling the twin problems of energy poverty and climate change today, by installing solar panels on the Senator Barack Obama School in Kogelo and on the roof of the house of Mama Sarah – the US President’s grandmother. The solar installations are part of a 20 day renewable energy workshop hosted by Greenpeace’s Solar Generation with 25 participants from the Kibera Community Youth Programme (1) and community members of Nyang’oma Kogelo. Young Kenyans are learning how solar photovoltaic panels generate electricity and about their installation and maintenance, the fabrication of self-assembling solar lamps and marketing potential. Kenya, like many other countries in Africa, is on the climate impacts frontline. It has seen a drastic reduction in rainfall in recent years. Drought has worsened problems in agriculture caused by poor land use and desertification, making Kenya’s large scale hydro power unreliable. Faced with these challenges, investing in solar energy technologies is a win-win strategy. It strengthens the economy and protects the environment, while ensuring a reliable and clean energy supply. The solar industry is ready and able to deliver the needed capacity. There is no technical impediment to doing this, just a political barrier to overcome as we rebuild the global energy sector. “It is time for the industrialised countries to give something back. At the Copenhagen Climate Summit this December President Obama and other world leaders must agree to avert further climate chaos including agreeing to fund projects like this throughout the developing world to help them both adapt to and mitigate climate change.” said Abigail Jabines, Greenpeace Solar Generation campaign coordinator. Greenpeace is calling for rich countries to contribute US$140 billion annually to support climate adaptation, mitigation and forest protection in the developing world. With just 15 weeks left to go till the decisive UN climate talks in Copenhagen, Greenpeace urges world leaders to emulate the innovative young people of Kibera and Kogelo and translate their climate rhetoric into action in Copenhagen. I’ve seen Greenpeace running this campaign for quite a few years. Basically the tissues that the large company Kimberly-Clark has been making come from ancient boreal forest, and it’s a contributor to deforestation, which is a major aspect of the global warming problem. Below is Greenpeace’s press release, and here is a great look back at their campaign on their site. Congrats Greenpeace! Washington — Aug. 5, 2009 — Kimberly-Clark Corporation, the maker of Kleenex, Scott and Cottonelle brands, today announced stronger fiber sourcing standards that will increase conservation of forests globally and will make the company a leader for sustainably produced tissue products. Greenpeace, which worked with Kimberly-Clark on its revised standards, announced that it will end its “Kleercut” campaign, which focused on the company and its brands. Kimberly-Clark has set a goal of obtaining 100 percent of the company’s wood fiber for tissue products, including the Kleenex brand, from environmentally responsible sources. The revised standards will enhance the protection of Endangered Forests and increase the use of both Forest Stewardship Council (FSC) certified fiber and recycled fiber. By the end of 2011, Kimberly-Clark will ensure that 40 percent of its North American tissue fiber – representing an estimated 600,000 tonnes – is either recycled or FSC certified, an increase of more than 70 percent over 2007 levels. Kimberly-Clark and its well-known global brands are an indispensable part of life for people in more than 150 countries. Every day, 1.3 billion people – nearly a quarter of the world’s population – trust K-C brands and the solutions they provide to enhance their health, hygiene and well-being. With brands such as Kleenex, Scott, Huggies, Pull-Ups, Kotex and Depend, Kimberly-Clark holds No. 1 or No. 2 share positions in more than 80 countries. To keep up with the latest K-C news and to learn more about the company’s 137-year history of innovation, visit www.kimberly-clark.com. The Forest Stewardship Council third party certifies that forests are responsibly managed. Certified products bear the FSC logo and can be traced back to specific forest areas. For more information, please visit www.fsc.org.